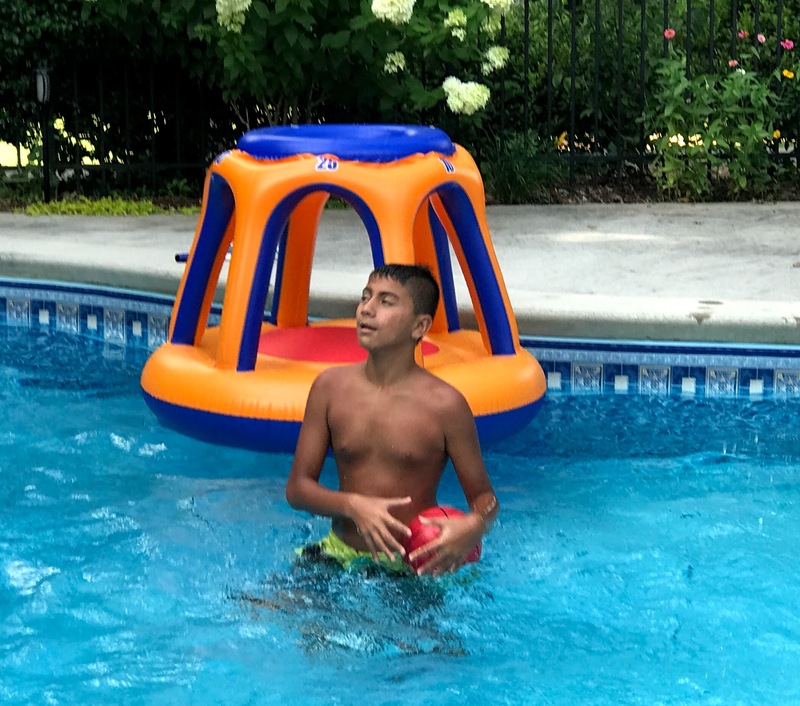 Teenage pool party games can include the typical swimming pool volleyball game or swimming pool football game, but there's a lot more you can do to make your teen pool party fun for everyone. One is to simply provide lots of floats - spring floats, chair floats, and a couple of noodles. Often teens can create their own fun with a few pool toys. 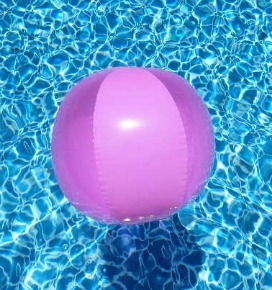 Our teenage niece loved this beach ball game icebreaker she played at a friend's pool party. Buy enough 24" beach balls so that each guest gets one beach ball. If you will be playing games with teams, buy half of the balls in one design and the other half of the balls in another design or color. Write the name of the guest using a permanent marking pen on the beach ball - do one for everyone. Throw the balls in the pool just before the guests come. After every one arrives, everyone jumps into the pool to find their beach ball. The ones with the orange, green and yellow designs are one team and those that have the other colored beach balls will be on the other team. Toss this thick foam disk like you are skipping a rock or like a frisbee. This Skip Disc skips across the water - it's easy and fun for anyone to do. There is no need for an organized pool game - just take turns skipping the disk to each other. It doesn't require much skill so anyone can play. A volleyball game can help get all the guests into the pool. A swimming pool volleyball game provides action and fun. This set is for those who like to play often as it is more expensive, yet more durable. 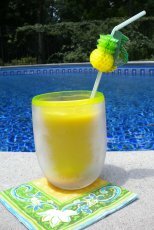 A less expensive option for those who want an easy set up for a party is this pool volleyball net. 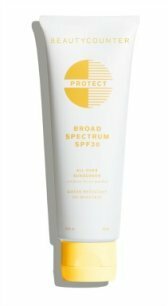 The price is around $35 and it does not come with a volleyball. Which is a great price if you have a volleyball or if you like playing with a light-up beach ball. Evening parties mean you can have lots of fun with light up party supplies. You can't go wrong with this light-up beach ball. Use it in place of a volleyball for night time fun. When the ball is tapped it lights up for several seconds and then goes dark. Tap it again and the lights start going again. A great teenage pool party game is playing basketball in the swimming pool. This affordable pool basket ball game will provide hours of fun for kids, teens and adults. The basket floats in the middle of the pool so it can be played anywhere in your pool. Easy to put up and easy to put away. Buy some extra basketballs so several kids can play at one time. This is a fun competitive game that's different than your typical pool volleyball or basketball. In this set you get two inflatable logs and two inflatable log boppers. The logs will hold adults that is if they can get on or stay on. Staying on the Log Flume Float is easier if you somewhat under inflate it. Have fun just watching people try to get on and stay on. Whoever gets "knocked" off first loses. The winner plays the next person. The person who is able to stay on the float for the most rounds wins. Why not play a round of golf in the pool? This pool game involves skipping the disk across the pool trying to get it into the net. The height of the net can be adjusted for different kinds of challenges. It can by played by kids, teens and adults. Four disks of two different colors comes with the game. Break up into two teams and the team with the highest score wins. Skip Golf is a fun game for a pool party. Our 13 year old niece loves diving games - using diving sticks or rings. But her favorite is Submergency. Do not leave this ball in the water when you are done playing. 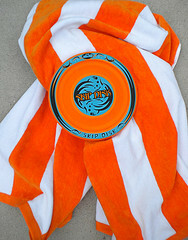 Water Jarts is a fun team game - especially for those who may not want to get completely wet or are not great swimmers. It's just like lawn Jarts - only in the pool. Simply take turns tossing the soft-grip darts at the target ring. The bright-colored flags make it easy to see in the water. Includes 4 pool darts, target ring, and storage bag. Preparation and forethought is important for a successful pool party. 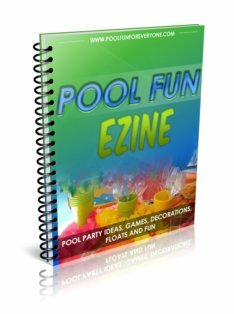 So get a couple of games or floats from your local pool supply store and as the party planner, get everyone in the pool to make the event fun and memorable.